Ex-Port Authority Official Says ‘Evidence Exists’ Christie Knew About Lane Closings – NYTimes.com. 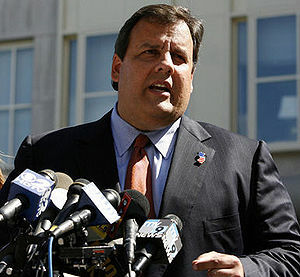 By Endorsing Romney, Is Christie Seeking VP Bid? “Mitt Romney is the man to lead America and we need him now,” that’s how New Jersey Governor Chris Christie opened his endorsement this afternoon of GOP candidate and former governor of Massachusetts Mitt Romney. Christie’s support comes just hours before this evening’s Republican debate at Dartmouth in New Hampshire. Could Christie be chumming up with Romney to seek the vice-presidential spot should Romney win over Perry and the rest of the GOP lineup? Last week, Christie announced that he would not be throwing his hat into the ring for president but he indicated that he would still remain active in the party’s process. Over the weekend, a pastor endorsing Texas Governor Rick Perry attacked Romney on the grounds that he was a Mormon. 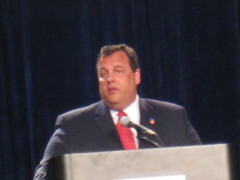 Christie indicated that one’s religion should never be a test in selecting candidates. While religious tests may play with some within the GOP, it will never wash in a general election. Polls are showing that Romney would be the best candidate to run up against Obama. Christie agrees saying that Romney is the “best” person to run in 2012. Republican establishment is concerned about how the party looks to the general public. Attacking another candidate’s religion makes the party look narrow-minded, or worse. There is currently an internal conflict in the GOP between “the establishment and the base” of the party, according to MSNBC. Democrats can only hope that the religious-right and tea party will ignore the polls and nominate Perry or Bachmann. Of course then again, if Romney were to win the nomination, it would make for a very spirited election period. Christie is evidently banking on GOP establishment prevailing. Should Romney win the nomination, we might be looking at Christie as his running mate. How many different ways can you say “no” before others get that you really mean it? New Jersey Governor Chris Christie is hoping that this morning’s press conference will finally end the chatter about his running for President. “Now is not my time,” Christie said from Trenton. Citing continued pressure from GOP big-money donators and party activists, Christie announced this to be his “final decision,” a decision based on “loyalty” to his duties as New Jersey’s governor as well as to his wife and family. Christie said that even though he has never hinted at running and that he has said no repeatedly (even releasing a video of all his “no’s”), that Republicans have kept the pressure on him and his family, coming after him at inopportune times, even at home. Evidently the final blow for Christie was this past weekend when he received a FedEx at their family home urging him, in no uncertain terms, to run for President. The FedEx, which Christie wouldn’t say who it came from, told the Governor that is would “be okay” for him to neglect his children’s games and school activities to run for President. Christie called today’s announcement “final” and said “that’s that.” For Christie, he hopes that the Koch brothers and other GOP big donors now look elsewhere.